The 10 Best Places for Milkshakes in New Jersey! Cool down in the hot weather, or simply pretend the weather is nicer than it is with a cold, creamy milkshake in the flavor of your choosing. These New Jersey spots for milkshakes offer handcrafted ice cream in special artisanal flavors, traditional options, and even crazy shakes that vary month by month. Stop by any one of these establishments for an excellent icy cold sweet treat. The Bent Spoon is an artisanal ice cream and dessert shop that focuses on crafting their small batch desserts using local ingredients. Flavors vary based on what local ingredients are in season, but you might find options such as pink grapefruit, organic lavender, caramel ice cream, and more. Ice creams can be used to create sandwiches, sodas, and milkshakes. The Bent Spoon also gives back to the community by helping to fund school gardens. Another artisanal ice cream spot on our list, Cookman Creamery offers a tight selection of both vegan and traditional ice cream flavors. Select from flavors such as butter pecan, espresso, or their popular honey lavender to create an original milkshake. They’ve also created an artisanal blend of medicinal vegan ice cream that have been infused with herbs. Torico Ice Cream hand crafts bold ice cream flavors in-house and serves them with a smile. Select from year-round options such as butter pecan, green tea, butterscotch, chocolate marshmallow, and more, or enjoy one of their special seasonal flavors. Any ice cream flavor can be enjoyed as a milkshake or malted milkshake to take things up a notch. Also on the menu are egg creams, ice cream sodas, and root beer floats. This retro spot for lunch has been open since 1931 and still maintains its classic atmosphere. In addition to a full food menu and homemade doughnuts, you’ll find creamy, rich milkshakes served in tall classic glasses. Flavors available include Nutella coffee, Oreo, cookies and cream, and chocolate. Milkshakes are served all day long. Springer’s Ice Cream has been open seasonally for more than 80 years and handcrafts delicious ice cream flavors. On the menu, you’ll find a variety of flavors including coffee, mint Oreo, and black raspberry. Milkshakes can be made from any of their flavors and can be topped with vanilla, chocolate, cherry, or strawberry syrup. In addition, they sell a Dream Shake, which is a mix of vanilla ice cream and one of their ices. Accompany your juicy burger with a large milkshake of the month at this highly rated restaurant that happens to be the home of the Burger Battle. 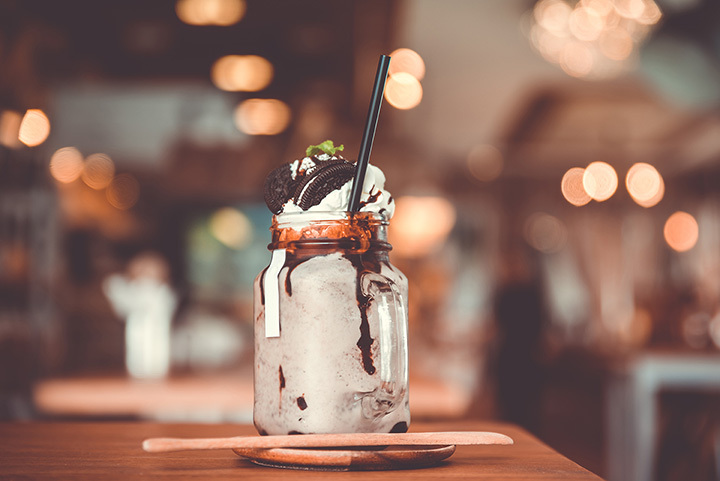 The amazing milkshakes here are served in canning jars and are practically overflowing with ice cream, whipped cream, and toppings. Try their Oreo milkshake or if offered, order their Rockin’ Blue milkshake, which is cotton candy flavored and highlights autism awareness. Celebrating its 75th anniversary, Holsten’s might be familiar to you if you’re a big fan of the show The Sopranos, as some of the show was filmed here. In addition to a full food menu and a selection of candy for sale, Holsten’s has homemade ice cream that can be used to create old fashioned, thick milkshakes. Flavors include mint chip, coconut chip, rum raisin, and coffee. Burger 25 builds massive burgers using premium Angus beef and a variety of other ingredients. In addition to a full food menu, Burger 25 crafts eight different milkshake options each month. They always offer the classics: chocolate, vanilla, strawberry, and Oreo, and each month they create four unique flavors. Special shakes might include brownie dough, cookie dough, and Butterfinger. Feel like a kid in a candy store at Bischoff’s Ice Cream, which serves all things sweet and delicious. This long-established local business has been hand making their ice cream since they opened and still feature a classic menu of sundaes, sodas, and creamy shakes. Flavors available include pistachio nut, French vanilla, and coffee chip. In addition to juicy burgers and crispy fries, Central Burger creates crazy milkshakes. Milkshakes available vary depending on the season, but you might find options such as s’mores, peanut butter cookies and cream, and birthday cake. Central Burger is a small restaurant with only a few seats, so you might even opt to take out your shake to enjoy the nice weather outdoors.